Understanding food sensitivities and how they affect your body can be confusing, which is why I turned to EverlyWell’s Food Sensitivity Test to get a clearer picture of foods that may be causing uncomfortable symptoms. 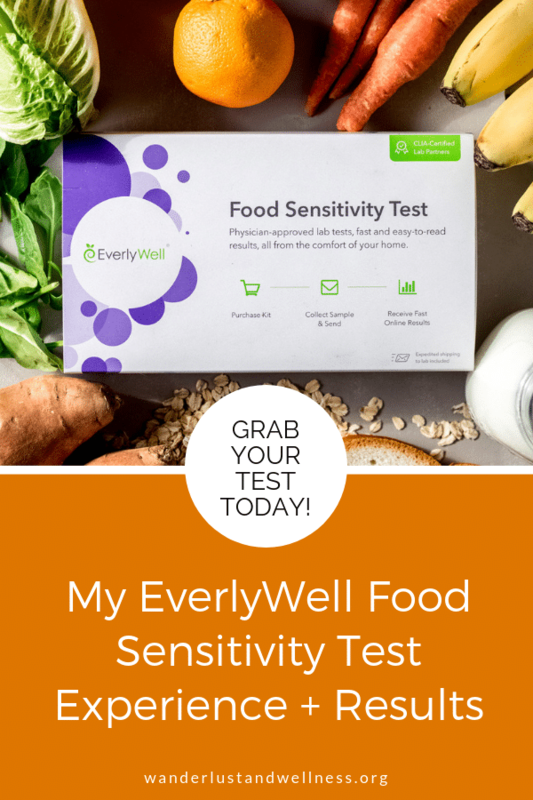 In this post I’ll share my experience along with my results after using EverlyWell’s Food Sensitivity test. This post is sponsored by EverlyWell and contains affiliate links. Wanderlust and Wellness may receive compensation if you purchase any product(s) through one of these link(s). Thank you for being a part of Wanderlust and Wellness. First and foremost, I want to start this blog post by saying I had great hesitation in even writing this post. Part of my hesitation is directly from my enneagram 9 personality and wanting to please everybody – because I know there will be SOMEONE who disagrees with this type of testing. The other part being from wanting to be very careful not to go down the rabbit hole of labeling foods as good or bad, not to support pseudoscience, and not to support diet culture masked behind “clean eating”. With that being said, I do believe there are benefits in following your intuition, even if that means experimenting with a test such as Everlywell’s Food Sensitivity test. Please note that I am not a registered dietitian or a medical professional. The views I express are mine alone, based on my own experiences, and should not be taken as medical advice. Please speak with a medical professional before making any changes to your current routine. If you’ve followed my blog since the beginning, you know that I started Wanderlust and Wellness because I wanted to share my health journey with others. Figuring out how to make a change in your diet or lifestyle can be very daunting to some people and I felt that if I could share my story with others it might help others along the way. About fourteen years ago I struggled with symptoms such as dizziness, headaches, and brain fog where I had a complete lack of concentration, aches in my joints, horrible GI issues that I’ll spare you the details on, and just pretty much felt terrible day in and day out. Some days the dizziness was mild and annoying, and other days it was like full on vertigo. And this was my normal. But one day the dizziness became very bad, and they admitted me to the hospital. During those five days, they did every test under the sun – they did an MRI, a cat scan, a spinal tap, they had a neurologist look at me, they tested me for a stroke, they looked in my ears, and they were all baffled – nothing – no results. So they discharged me, and I spent the next ten years walking around dizzy probably about 75% of the time. I had to adjust and come to terms with this being my new normal. I couldn’t just lay in bed because that would literally be every day. I couldn’t call in sick to work because that would be every day. I had to learn how to function feeling terrible and dizzy day in and day out. I know my family, friends and now husband probably had no idea how dizzy I felt every day. It wasn’t until I started to investigate food sensitivities and their relation to symptoms such as dizziness, headaches, joint pain, etc., that I began to see the connection between the foods I was eating and my symptoms. I ventured down the path of Paleo eating and began to rid myself of all symptoms. This is about the time that I started Wanderlust and Wellness – which started out with mostly Paleo-friendly and gluten-free recipes. I have to say, healing all of my issues – everything that had stumped the doctors – by simply changing up the foods I was eating was eye-opening while also such a relief. After about a year into eating “Paleo”, I noticed I was reverting back to an unhealthy relationship with food. I had developed a fear of certain foods, I was guilty of labeling foods good vs. bad, clean vs. dirty, and I began developing anxiety over eating in situations where I couldn’t control the menu. I would stress about eating foods outside of the Paleo parameters. It was about this time that I began to research and understand intuitive eating. One pillar of intuitive eating is making food choices that honor your health and taste buds while making you feel well. I knew deep down that gluten did not make me feel well. However, I wanted to have a little more peace of mind when it came to food sensitivities. I wanted a clearer picture of the foods that could be causing uncomfortable symptoms, and this is when I found Everlywell’s Food Sensitivity test. 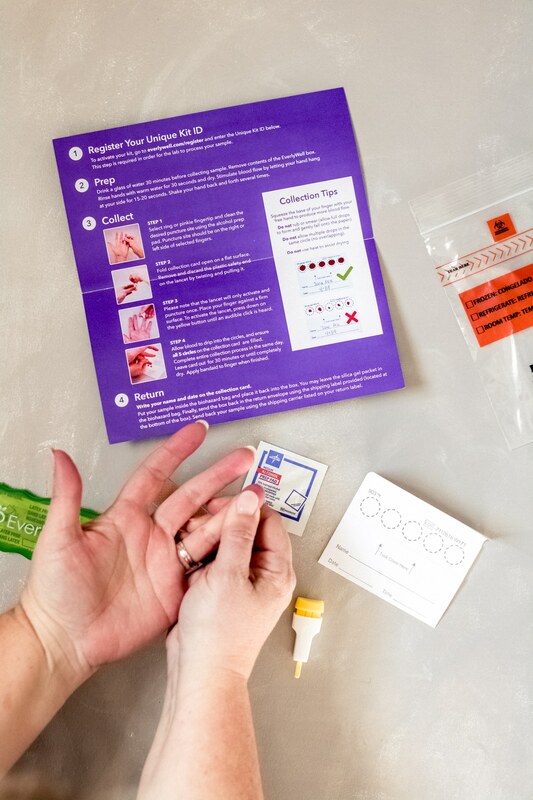 After ordering your kit online, you’ll receive a box with everything you need in order to complete the food sensitivity test. They provide you with a step-by-step instruction booklet that covers the entire process. 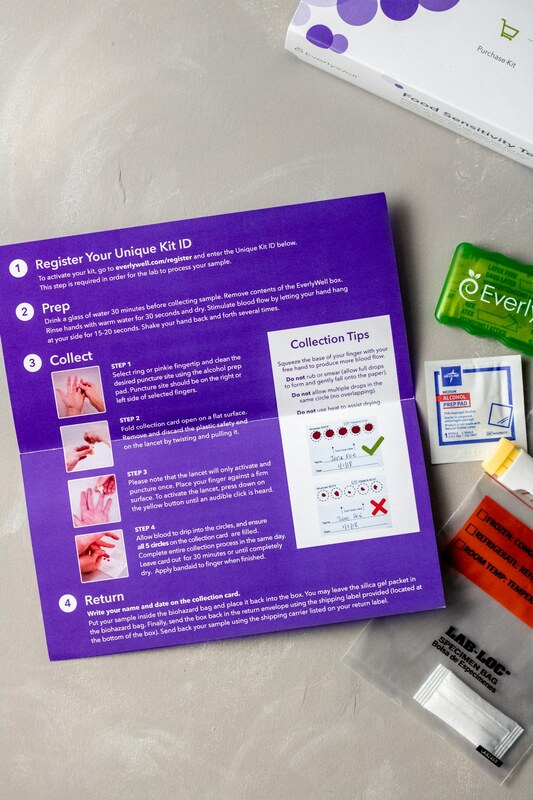 The instructions also include pictures and images on what the blood collection sample should look like. To complete the at-home food sensitivity test, you’ll be collecting a very small blood sample from your fingertip. 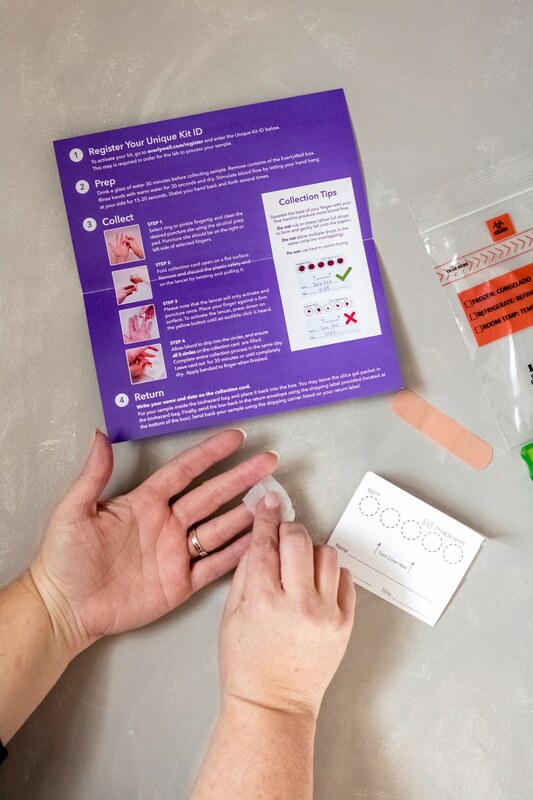 The included instructions cover which finger to choose and how to prep for the blood sample. 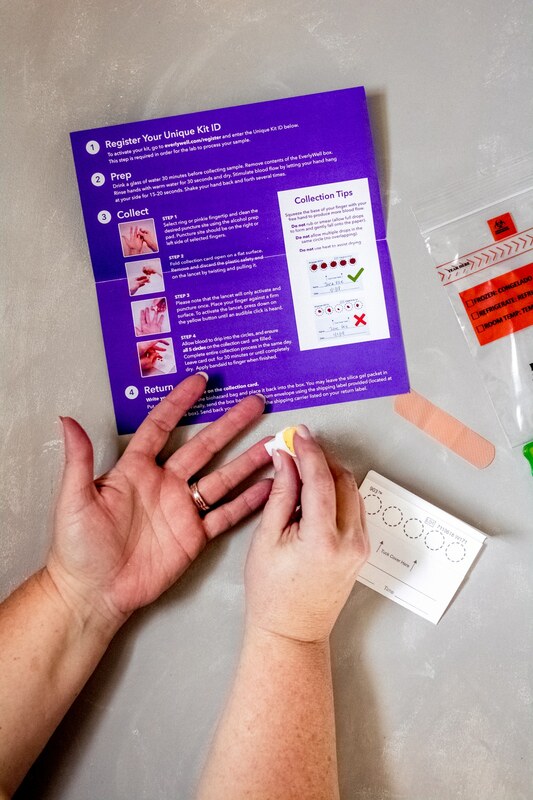 To prep your finger for the blood sample, you’ll first clean the area with the alcohol pad provided. Next, using the lancet provided, you’ll prick your finger and begin collecting the five blood samples on the collection card. I DREADED this part because I’ve had a few terrible experiences with finger pricking, however, this lancet was easy to use and did not hurt at all! You’ll carefully let the blood drop onto the collection card. You’ll collect five small samples, which is equivalent to five drops of blood. 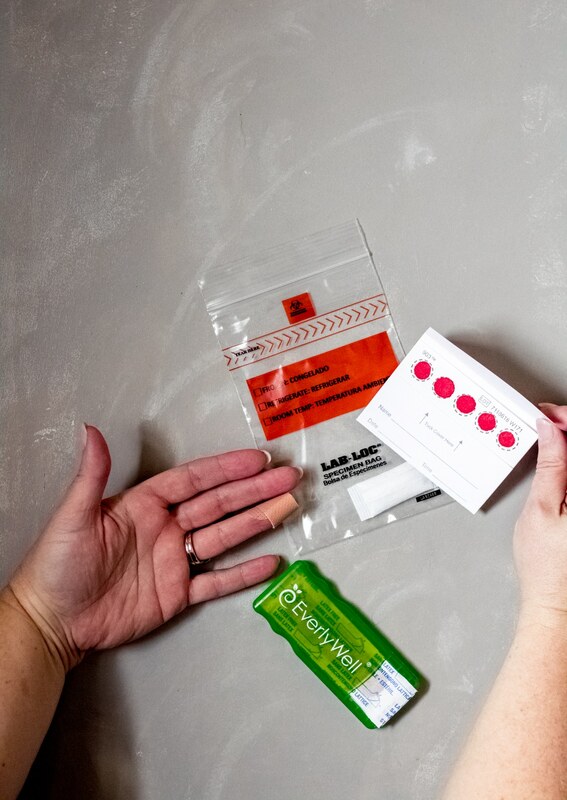 After you’ve finished collecting the samples, use the band-aid provided to cover your finger and follow the directions for packaging and sending off your collected sample. After sending off your blood collection sample, your results will arrive back to you via email in about 5-10 days. You’ll be able to log into your EverlyWell account and easily view your results. You can also download your results as a PDF document if you’d like to share your results with a medical professional. The EverlyWell Food Sensitivity test measures your body’s immune response to 96 foods by measuring the IgG Reactivity. Each food will be rated on a Class scale of 0-3. The results are intended to inform you about certain foods that may be causing reactivity resulting in uncomfortable symptoms. They offer suggestions for a short-term elimination period of higher reactivity foods and offer advice for finding the right balance between minimizing your symptoms while maintaining a lifestyle you enjoy. You will not find any fear-mongering language or any labeling foods as bad or dirty. The test provides personalized information to guide you; they are not intended to substitute any medical advice or diagnose any disease. I encourage you to explore the results and if you so choose, speak to a qualified health care provider if you have further questions. I will admit, most of the results from my food sensitivity test did not surprise me. Over the past four years, I’ve eliminated various foods and tested my body’s reaction to reintroducing those foods. So I felt like I had a fairly good understanding of foods that caused uncomfortable symptoms prior to taking this test. 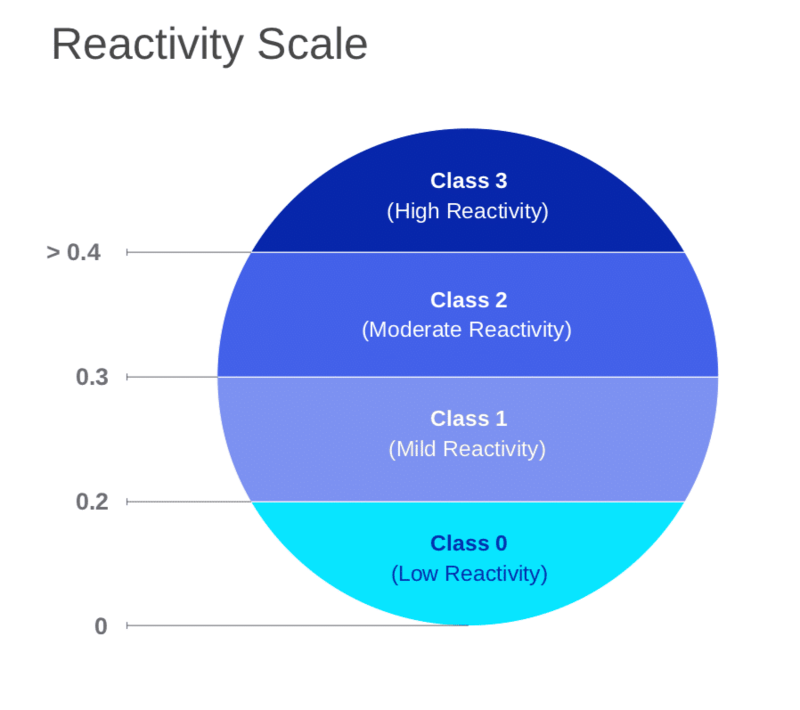 In the image below, you can see I had zero high reactivity foods, one moderate, and several mild. The only item on this test that surprised me was Brewers Yeast! Sadly, this means beer and wine. Womp, womp. Coconut also surprised me because I’ve never noticed it causing any symptoms so I’m going to explore that item further. As for everything else, I already knew they caused MAJOR issues. A food sensitivity test is not designed to diagnose any medical condition or disease. I cannot stress this enough. If you feel any negative feelings or anxiety around food, I would not recommend taking this test and instead, seek to work with a non-diet registered dietician to heal your relationship with food. Some of my favorites are Cara Harbstreet and Alissa Rumsey. This test requires collecting blood samples using a lancet. Food sensitivity testing DOES NOT replace food allergy testing. If you suspect a food allergy, please seek medical testing. 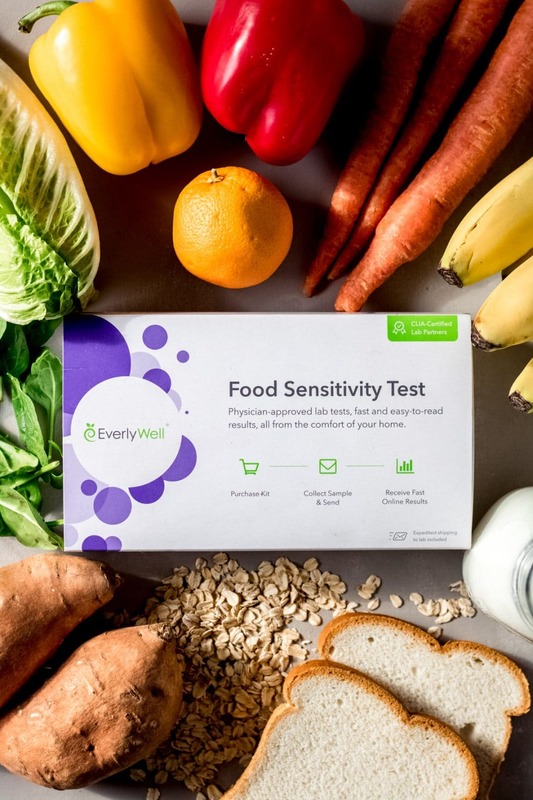 If you’re experiencing uncomfortable symptoms such as dizziness, headaches, joint pain, fatigue, brain fog, and are curious about any food sensitivty connections, completing an EverlyWell Food Sensitivity test would be an avenue you could explore. 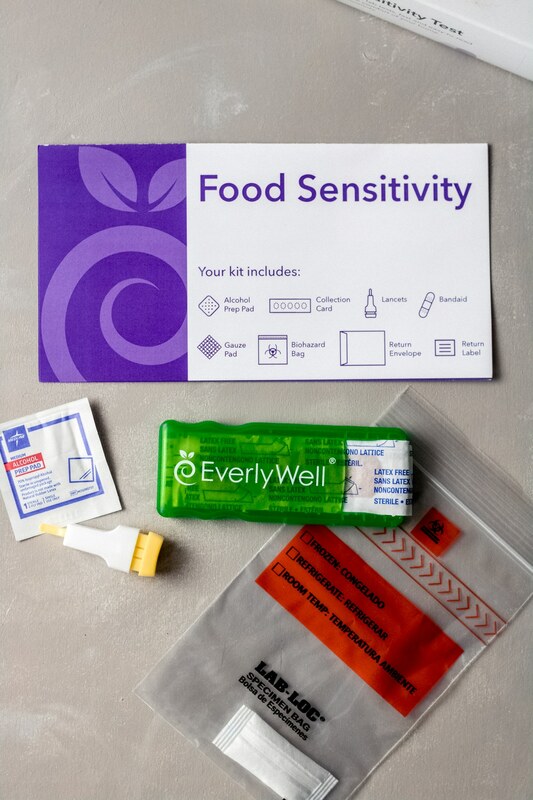 I hope my experience with EverlyWell’s Food Sensitivity test has provided you with a little more information and clarity regarding food sensitivity testing. 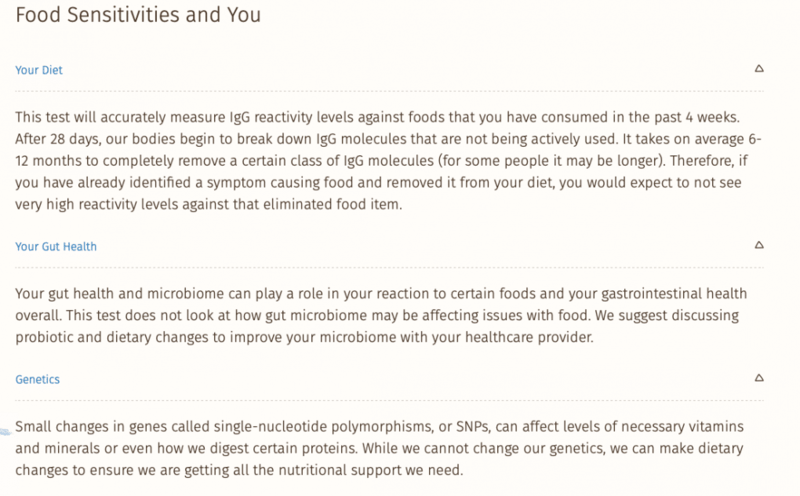 As I previously mentioned, I chose to take the test as a starting point for exploring food sensitivities, while also supporting an intuitive eating lifestyle. While I do make a small commission off of any purchase of this test, I would only encourage you to do so if you feel absolutely comfortable with the test, with your relationship with food, and urge you to speak to a non-diet dietician or other medical professional if you have any questions surrounding your test results.